Coupons may not be combined with any other offer. Limit 1 discount per vehicle. Coupon void if altered. Expires 05/04/2019. Coupons may not be combined with any other offer. Limit 1 discount per vehicle Coupon void if altered. Expires 05/04/2019. Save Up To $100 On Repairs and Maintenance Savings based on 10% discount off labor charges. Coupons may not be combined with any other offer. Limit 1 discount per vehicle. Not valid on tires or batteries. Coupon void if altered. Expires 05/04/2019. Ace Auto Doctor and Repair is a full-service preventive maintenance and automotive repair center that has been performing high quality, guaranteed automotive repairs for the Bettendorf, Davenport & Quad City areas since 1969. Family owned and operated, with two generations in the auto repair industry, we have the skills and know-how necessary to get the job done right the first time. We are your logical alternative to the dealership for all scheduled maintenance of your personal vehicle, or fleet car or truck. Bring in your foreign and domestic auto, SUV, or pickup today with complete confidence that your vehicle will be serviced correctly while maintaining your manufacturer's warranty. We use the latest diagnostic equipment to guarantee your vehicle is repaired or serviced properly and in a timely fashion. We only use quality replacement parts, and our technicians are ASE-certified. We are located in Bettendorf, IA and serve the Quad Cities area. We service Bettendorf, Davenport, Le Claire, Princeton, Eldridge, Pleasant Valley, Long Grove, Park View of Iowa — and Moline, Rock Island, East Moline, Milan, Port Byron of Illinois. No matter where you are, we will service you. We repair radiators, exhaust systems and mufflers, brakes, batteries, axles, steering and suspension, fuel injection systems, engine electrical diagnosis, cooling systems, driveline, A/C and heating, exhausts, starting and charging systems, transmissions, and clutches. We also do tune ups, factory scheduled maintenance, industrial radiator repairs, and do complete engine overhauls - just to name a few of our automotive service, maintenance and repair services. Acura, Honda, Hyundai, Infiniti, Kia, Lexus Mazda, Mitsubishi, Nissan, Scion, Subaru, Toyota, Audi, BMW, Fiat, Jaguar, Land Rover, Mercedes, Mini Cooper, Porsche, Saab, Volvo, Volkswagen, Buick, Cadillac, Chevrolet, Chrysler, Dodge, Ford, GMC, Jeep, Lincoln, Mercury, Oldsmobile, Pontiac, Saturn, Suzuki. Ace Auto Doctor and Repair hires trained technicians and automotive mechanics in the Davenport and Bettendorf, IA areas who are willing to stay on top of the latest technology in the automotive industry through ongoing schools and training. The shop takes pride in being up to date, clean and as efficient as possible to get your car, truck or SUV in and out as quickly as possible. The professionals at Ace Auto Dr. & Repair are a part of an elite network of thousands of professional independent automotive service facilities across North America. When you have service or repairs performed at Ace, you're covered by a nationwide warranty., Ace covers most parts and labor for 12 months or 12,000 miles, which ever comes first. ACDelco provides coverage at other facilities when traveling more than 25 miles from Ace (regardless of the brand parts Ace installs). Eligible services include Towing, Lock-out Service, Flat Tire Assistance, Fuel, Oil, Fluid and Water delivery, even jump starting (up to $75 per occurrence)!. 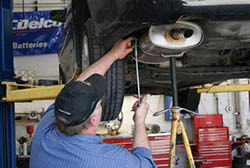 Ace Auto Doctor and Repair is committed to providing our customers high quality service, at a fair price, performed by skilled and trained technicians. We use quality parts and provide a solid warranty on all of our services. We take great pride in our reputation, and maintain a commitment of honesty, quality, and high ethical standards. Our goal is to give the public a positive view of our industry, by not only providing the best service we can, but also educating them as well.